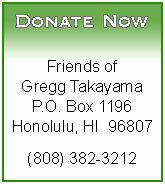 Gregg and I have been effective partners on many issues affecting Pearl City. I hope you will support his re-election so we can continue to work together to improve our community and our State. Hawaii Regional Council of Carpenters: "You have demonstrated your unwavering support of issues that are important to our members, their families, and the construction industry as a whole." International Union of Painters and Allied Trades: "Your continued commitment to the working men and women of our state is truly a testament of your support of the construction industry.